Farrah Parkes and Brad Linder launched a mission to interview other mixed-race couples to commemorate the 50th anniversary of a monumental civil-rights decision by the Supreme Court. Fifty years ago on Monday, a landmark U.S. Supreme Court civil-rights decision declared that state laws that barred mixed-race marriages were unconstitutional. Before that Loving v. Virginia decision, 16 Southern states still recognized those laws. Afterwards, Mildred Jeter and Richard Loving, along with countless other interracial couples, were free to legalize their relationships. To commemorate that golden anniversary, and the unions made possible because of it (estimated at one sixth of all newlyweds today), an interracial couple from Philadelphia has embarked on a year-long “The Loving Project Podcast” mission to tell their stories. It’s an effort to both celebrate the civil-rights landmark and delve into what it’s like to be part of a mixed-race marriage in 2017. 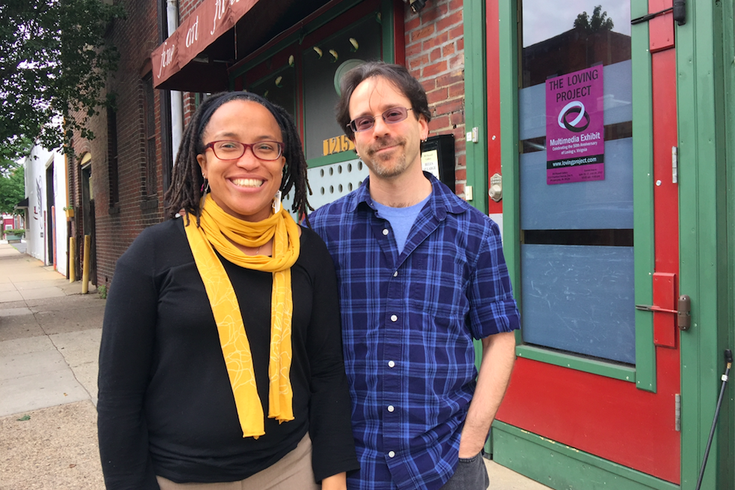 Along with another interracial couple, Farrah Parkes and Brad Linder are featuring those relationships in a multimedia exhibit which opens at a Fishtown art gallery on Friday and runs through the rest of the month. Farrah is the director of education, technology and job readiness at the Lutheran Settlement House. Brad is a local audio journalist who used to work with WHYY-FM. Neither was subject to the interracial-relationship ban in their lifetime. The married couple caught up with PhillyVoice at a Fishtown coffee shop on Wednesday to talk about their experiences and what they’ve learned during a podcast project for which they’ve already completed 12 of a planned 26 episodes. They met 13 years ago through an online-dating site. Farrah’s photo was so small – “postage-stamp sized” – that the best Brad could do was guess that his date-to-be was African-American. “I think it said so in my profile,” she retorted when he said he could barely make out dreadlocks. They met at “an impersonal” Rittenhouse Square coffee shop, each not wanting to pick their favorite spot in case the date didn’t work out as they’d look poorly upon the location. They walked off into the park and talked for hours upon hours. That he’d never previously dated an African-American woman wasn’t a consideration. He was taken by her beautiful smile. Farrah said her diverse group of college friends resembled the “United Colors of Benetton” and, having grown up in Jamaica, she wasn’t deeply steeped in the realities of the African-American experience. Those things considered, there wasn’t much of a concern about how people would react to their mixed-race relationship. In fact, she said, Brad didn’t realize it could be an issue early on. It’s more common for African-Americans to catch onto those looks. That changed about a year into their relationship, during a trip to Washington D.C. when they realized “people look at us more here” than in Philadelphia. When they stopped off in central Pennsylvania en route to visit Brad’s family in Ohio, there were more looks. “There will be black people there, but not black and white people walking together,” Farrah said. Still, they don’t face a lot of discrimination in their day-to-day lives directly because of their mixed-race relationship. They don’t feel unsafe. The first instance of friction they could recall was when someone pushed in between them on a flight of steps at SEPTA’s City Hall Station, not realizing they could be together – until Brad sidled back up to his wife. Yes, some of the couples they’ve featured on the podcast have faced more challenges than Farrah and Brad. Though they don’t have children, some of the couples they’ve interviewed do, and that dynamic opens many new layers of discrimination and adjustments. Like Florence and Ed, who met in the 1960s and got married just one year after the Supreme Court decision legalized their union. Early on, their relationship not only faced legal challenges, but objections from family members. Not having clear role models from which to draw suggestions made it more difficult to navigate their world. “They were so brave to be together in a way that we haven’t had to face,” Farrah said. And Michelle and Melissa, the latter seeing relationships strain with extended family members because of their attitudes toward her African-American wife. “It’s exponentially more complicated when you have children,” said Farrah, particularly for a white father who didn’t get “the talk” when he was younger as black youths do regarding how they’ll be treated in the world. Their aim isn’t to solely dwell on the problems that arise. Rather, Farrah and Brad seek to highlight the beauty of relationships. “Hearing people talk in their own voices” makes that much more compelling, Brad said. Farrah and Brad didn’t learn about the Loving decision until shortly after they were married in 2006, but knowing they couldn't have wed in the past left a mark. In recent years, she’s marked the anniversary on social media and “made stickers for coworkers” about it. They’ve seen other cities host larger events related to it, and noted that there’s an annual gathering of mixed-race couples at Smith Memorial Playground in Fairmount Park. When someone suggested they should do something to honor the 50th anniversary, the plan for the podcast took hold shortly after the November presidential election. They started doing interviews in December and launched the first episode in the first week of January. They’ll run biweekly throughout the year. “The Loving Project” multimedia exhibit is a collaboration between Brad, Farrah, Cathie Berrey-Green and Al Green. It features portraits of interracial married couples along with audio taken from their podcast episodes. The opening reception at Bill Russell Gallery (1215 Frankford Ave.) is from 5 to 9 p.m. Friday and the exhibit is open on Saturdays in June from 10 a.m. to 4 p.m.
Another aim is to “build a sense of community among multiracial families in the area,” and they’re planning an August get-together of families from the podcasts and others. “People feel like they’re less alone, that they’re not the only ones who have these crazy experiences,” she said.